Yesterday I spent the day baking and pickling! While I would love to tell you everything was from my very own gardens; we did not have a very successful harvest this year. We have decided to remove the majority of the soil from our raised beds and start over; it may sound pretty drastic; but I spend too much time & money on the beds for them not to provide me a little something to help feed my family and friends. I was able to use up my own cucumbers to make a dozen jars of Kosher dill pickles – we mostly use them for sandwich’s & burgers. 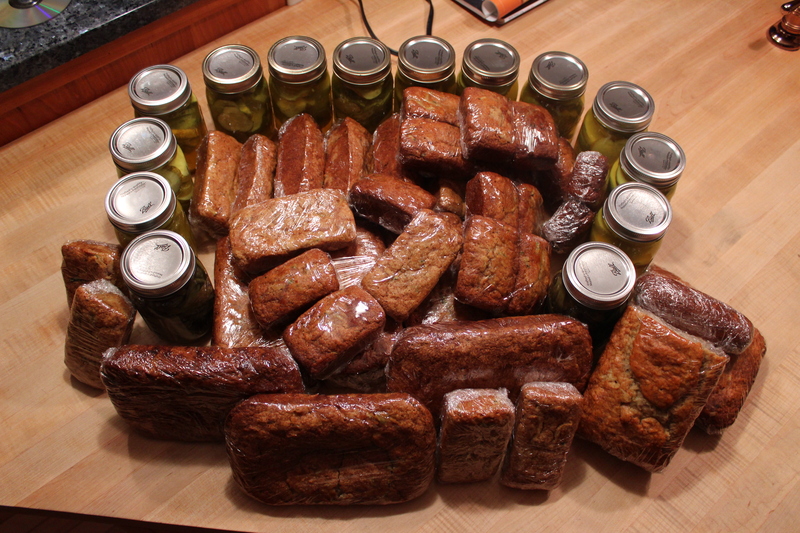 I would like to thank a couple of my husbands employees for their Zucchini and Green beans; which I made 36 various size loafs of zucchini bread and was able to make a couple of jars of dilly beans for the very first time. I buy Banana’s every week at my house so I always have those on hand; they do not always get eaten in time so I will put the brown banana’s in the fridge, If i cannot get to them fairly soon I throw them in the freezer until I am able to make Banana Bread. Because my son does not like nuts there are always 2 loaves made. I think he does that so he gets his own loaf; just saying! While I was out getting my supplies on Saturday morning I ran into the cutest little old lady, we were standing there looking at the canning items left; note to self get your stuff together when they first arrive in the stores. We started up a conversation about them not having what either of us needed. Why I thought she was cute was her comment “I think there are a lot of new people thinking they can pickle” I immediately told her I have been doing this for years, I was even chuckling to myself thinking why did I need to defend myself for being in that aisle. I have pickled cucumbers, salsa, tomato sauce and spaghetti sauce over the years. I do enjoy the pickles the most. I gave away all my spaghetti sauce, we didn’t like the taste, my in-laws loved it. The garden salsa was very good, however there is nothing like fresh garden salsa. I had never had nor heard of dilly beans; probably because I am not a fan on green beans so I have never grown them, so I didn’t ever need to find out what to do with them. I am not too sure they turned out, only because they do not look like the ones I have tried. we’ll see in a couple of weeks. Labor Day Weekend – Two states, Two families, Two days.